Vibra-TITE Excel 624 General Purpose Accelerator is an ozone friendly accelerator used for normal curing of cyanoacrylates and to prepare the surface for bonding. Excel 624 is also designed to provide a fast cure of thick deposits of SuperGlues or for post curing excess adhesive outside of the bond line. Vibra-TITE Excel 624 Accelerator prevents absorption of the lower viscosity SuperGlues into porous items. This product is also used for fillet curing and for wire tacking jobs. Product is normally hand applied from the bottle by brushing, wiping or spraying onto parts. 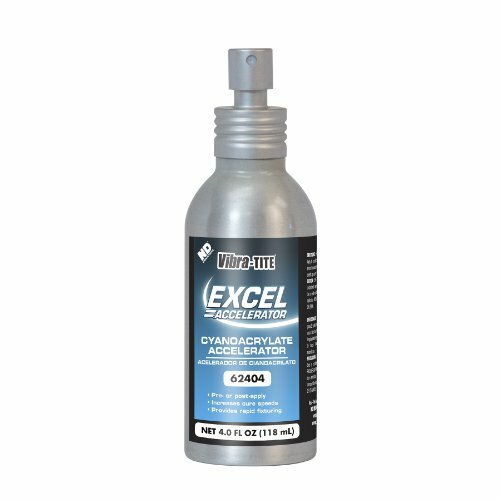 Excel 624 Accelerator is an ozone friendly blend of flammable solvents. Care must be taken to avoid flames. Shelf Life is 12 months at 68 degree F unopened. High flammability. Cure speed is dependent on the adhesives viscosity, with the lower viscosity SuperGlues curing faster and the gels slower. Store in cool area out of direct sunlight. 4 oz Bottle. View More In Adhesive Accelerators. 3M Scotch-Weld 82332 Instant Adhesive CA50 Gel, 20 g, Clear, 0.68 fl. oz. BSI Bob Smith 152 Insta Set Accelerator, 8 oz.